Write for FretBuzz! Email the Editor. Want to see Grisha on 9/13? Concert info online here. Nowadays there are great guitarists performing on big stages. One in particular is Grisha Goryachev. He is a virtuoso flamenco and classical guitar player. He began to play at the age of six. Taught by his father, he quickly showed potential on the guitar. As he got older and practiced more he became a flamenco guitarist - a style that originated in Spain. Grisha was a prodigy who became famous in Russia, then in Europe and now even here in the United States. I have heard him playing Spanish songs such like Farruca, Panaderos, and Taranta. He has a beautiful and fascinating way of playing his guitar. When you hear him play you can feel he and the guitar as one. His emotions and energy put into his fingers - where they meet with the strings and produce a fantastic sound. His motions with strumming and plucking the guitar are strong. For every song that he plays, you can picture a scene! His notes are clear and his sound is perfect - whether he plays a piece that is loud and piercing or a soothing and quiet song. On top of that he seems strong and confident of playing any piece he is given, he has a great talent for the flamenco style and for playing the classical guitar. I myself am a guitar player, but not as quite as good as Grisha! I am proud to say that I and my class – along with several others – will have the opportunity to open for him in the Long Center here in Austin, Texas. We have been practicing a piece we’ll perform to open for him. After we play we get to sit back and hear him and his music. I can’t wait to watch him fill the audience with passionate and fun music. Grisha Goryachev is great at what he does and how he does it. A young and confident man such as himself will be a great pleasure to meet. - Miguel Rodriguez is a freshman at Akins High School. 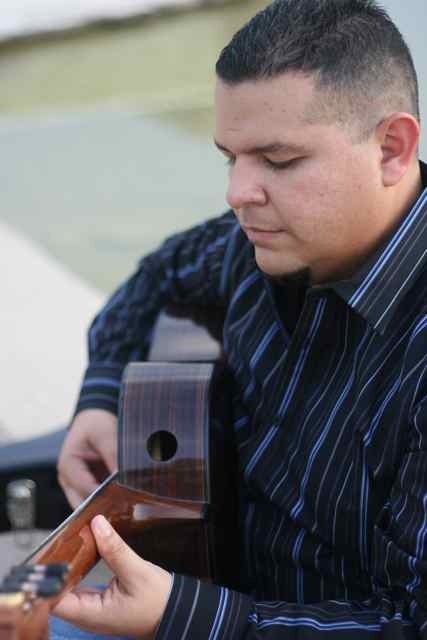 He began guitar at Fulmore Middle School, and auditioned directly into the advanced class at Akins as a first year high school student. Grisha Goryachev represents a pinnacle of classical guitar. The man is a perfect example of what the instrument, and the player, are capable of. When I heard that my ensemble is going to perform with him, I was not only excited for another great performance with a professional, but I was also given the chance of writing about what it's like. Honestly, I can't believe the luck and privilege I have to be able to do this! If I was to guess who Grisha studied with, I'd say Eliot Fisk. When he performs he gives the same level of separation as Mr. Fisk. They both make it seem as if they are non-existent and only the guitar is performing. Along with that, Grisha just has amazing speed. Turns out I was right, Grisha studied with Mr. Fisk at New England Conservatory of Music. Grisha is the type of guitarist I wish to be when I get older. The music he plays is strange and abstract, but when you hear it and take it in it fills you with emotion and awe. My favorite thing, and something he and I actually have in common, is that we don't look at the guitar so much when we perform (though he does a way better job of it)! He and I like to move and feel the music. He does it in such a way that it seems as if he is a lone member of his own audience, free to move to the music as it moves him (emotionally). He even closes his eyes giving himself a heightened sense of hearing and with it a deeper connection to his music. I remember the first time I saw a professional guitarist. His name was Alejandro Cote and he was a Caribbean guitarist that played some flamenco pieces. The speed and emotion he was able to project amazed me. My eyes had a hard time just watching and trying to keep up with and it all made me very curious about that style of guitar. I’ve practiced a lot since then, and the more I practice the more anxious I get. In my mind I'm always asking myself if I'm there yet, at that level of skill - slowly but surely my skill is increasing. However, I know I can push myself more still. I myself can count the number of years I've been playing on one hand, and if I'm going to get to the same level as these titans of guitar, I'm going to need years more of intense practice. I actually had the pleasure and honor of not only attending, but opening up for, an Eliot Fisk show. He completely blew us out of the water, though he probably didn't do it on purpose. That night I was studying his technique and his hand movements. He really showed me that I have a long journey ahead of me with the instrument. I can't say that I will make it to the point where I can play that same Paganini Caprice, but I will say that it is a goal of mine to reach that level of skill someday. - Austin Davenport is a senior at Akins High School. A third-year guitar student, currently in the advanced ensemble, Austin was a member of a select group of students that performed in KMFA’s “Kids Recording Kids” this past summer. What a show! The Brasil Guitar Duo took us to so many places Friday night – and in the best way. From their opening tango Zita (by Piazzolla, on you tube) they changed direction and played a stunning Rameau arrangement by Joao Luis before heading back to the 20th century with Mario Castelnuovo-Tedesco’s C# minor Prelude and Fugue. The rest of the evening’s music was from Brazil, but that doesn’t mean it wasn’t tremendously varied. We saw tons of speed, lots of accent and rhythmic drive, but we also heard tremendous depth throughout. 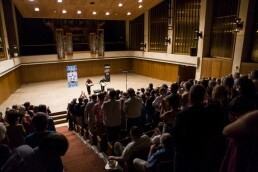 A Fala da Paixao by Gismonti, toward the end of the concert, had the audience of about 600 totally captivated. In fact their second to last selection - also Gismonti – Forrobodo, was so spectacular that many in the audience thought the concert was over! They received an exuberant standing ovation, along with several bouquets of flowers. They left the stage at that point, and came back out to play their final, programmed piece, as their encore! Here are a few choice shots from photographer Arlen Nydam. The duo arrived on Friday late-morning from New York. We grabbed a quick lunch (cheeseburgers from Five Guys) and headed over to KUT radio for a live performance on Michael Crockett’s Horizontes on KUT 90.5FM. They had just a few hours in their hotel, before heading over the UT’s Bates Recital Hall to warm up. Here they are trying out the hall (which they loved!). Each year for the past 5 or so years, it’s been my pleasure to work with my dear friend Michelle Schumann and her fabulous Austin Chamber Music Center. Their marvelous summer festival is just getting under way – so be sure and check out the great stuff still to come! Here we are doing our little pre-concert comedy routine! The concert was truly superb. Michelle and I brought the BGD here three years ago, and we were excited to have them back again. Their performance Friday showed us just how good they really are. From their original compositions and new arrangements, to their fantastic music-making overall, we, and our audience, were overjoyed. Here’s a shot of the standing ovation. Brasil Guitar Duo - Matt's preview! What makes the Brasil Guitar Duo great? My top four are fresh invention, crisp rhythm and articulation, authentic Brazilianness (Brazilianity? ), and outright speed and power. Friday 7:30PM, Bates Recital Hall (UT). Tix ($25) online or 300-ACGS. The BGD does their own thing. Friday their program is largely music of their native Brazil – 7 of the 9 selections. Of the 9 pieces, 4 of them are new arrangements by the BGD including one I’m particularly excited to hear: a baroque gem by the great, expressive French master Jean Philippe Rameau. While a video of them playing the Rameau is not yet available online (you’ll just have to settle for the real thing! ), you can get a taste of their baroque interpretation in this performance of the Gigue from Bach’s French Suite No. 3. I will now jump the gun and say that, if you watch this video, pay special attention to the crisp Rhythm and Articulation (I know, next topic area) in this performance – it’s fantastic! – it makes the performance really pop. As you now know, I’d recommend starting with a good listen to the Bach performance above to get a sense of their drive, their fastidious articulation… Wait, what do I mean by articulation? I mean the length of the notes they play, the manner in which those notes are attacked, and how that affects the rhythm, stress, and cadence of their music-making. Listen to the very first two melody notes of the Bach performance about 3-4 times. Just the first two notes. What do you hear? The first note is exceptionally short and the second feels longer and heavier. The second feels longer and heavier in part because of its volume, accent and length, and in part because we hear it relative to the short note that precedes it. The result? Rhythmic clarity! And they do that, intentionally, all the time! These two rock the Brazilian! Over 130,000 have watched this phenomenal performance of Egberto Gismonti's Sete Aneis. It just makes you feel so good. Anyone who saw Yamandú Costa’s unbelievable performance for us in April will recall the humor, the drive, the energy, the beauty – all coexisting, indeed thriving, in his Brazilian selections. On Friday, the BGD will present a range of Brazilian selections from relatively formal to relatively pop. That was certainly a hallmark of Yamandú’s concert. In fact, every guitar concert is made just a touch better with a healthy dose of speed and power, wouldn’t you agree? Check out this exciting tango performance of Astor Piazzolla’s Zita that’s been enjoyed by over 90,000 music-lovers online, and you’ll get a sense of what these guys can do! We’re in for quite a ride, and I look forward to sharing it with you. Our presentation of the Brasil Guitar Duo is in collaboration with the Austin Chamber Music Center – in the middle of their award-winning summer chamber music festival – and is generously sponsored by Michael and Carol Fields. Our summer series media sponsors are Time Warner YNN and KUT 90.5. Our hotel sponsor is the Radisson Town Lake. All great projects we’ve engaged with here at ACGS have had many parts and have been possible thanks to many collaborators. For our June 22nd screening of 1927 Lon Chaney silent masterpiece “The Unknown” with live, original film score (tix), our partners are the Alamo Drafthouse and AMOA-Arthouse. Lately I’ve been sharing 7 vignettes about one of the brilliant musicians who is creating the film score. But ever since our inspiring production walk-through of the gorgeous lakeside Laguna Gloria estate and grounds – where we’ll show the movie for 500 with multi-course feast and wine-pairings – I really wanted a chance to share stories about that unique Austin treasure. There is no one better to ask than Judith Sims, Senior Director of Education, Art School & Laguna Gloria Site Director, who has been at Laguna Gloria for more then thirty years. She was kind enough to share some memories and insights with me. Matthew Hinsley: We at ACGS are very excited about this project, but it's not the first time movies have been shown at Laguna Gloria right? Could you share a memorable movie project? Judith Sims: Films were shown regularly at Laguna Gloria from 1973 to 1988. We hosted everything from highly experimental European avant-garde cinema, to a retrospective of American independent film icon Stan Brakhage, to thematic series on Dashiel Hammet, Hardboiled Detectives, Women Film Directors, and Comedies of Remarriage. We co-sponsored film series with the Austin Film Society, the UT/RTF Department, Cinema Texas, and a host of other film groups. MH: In walking the path to the lower grounds where we'll show the movie, we passed a number of interesting and historic items including the gazebo and the gate and archway - could you tell me a bit about what people can expect to see on their journey to see this movie? JS: Laguna Gloria was conceived by Texas Legend Clara Driscoll - noted philanthropist, cattlewoman, Democratic politician and gardener - who gained national fame as “the savior of the Alamo” (which she bought to rescue it from commercialization in 1903). As a passionate gardener and lover of antiquity, she was heavily influenced by her European travels. Laguna Gloria is laid out in accord with late 19th and early 20th landscape aesthetics: the upper grounds represent the beautiful (balanced, open visits, formal); the path to the point and lower grounds represent the picturesque (asymmetrical, mysterious, non-linear, rustic). The Path to the Point was called Lovers Lane by Driscoll and ended with a “folly” or Greek Temple, another nod to classical European garden features. Originally, before the Tom Miller Dam was built one could boat from downtown to the shores of Laguna Gloria, landing at this small Temple with its original State Capitol gates, and promenade on the winding path up to the Villa. MH: What is your personal story at Laguna Gloria? How long have you been there, do you have a particularly fond memory you'd like to share? JS: I like to say that Laguna Gloria is a place where people create memories; it is so special. I have many memories myself having been here for over 30 years: people doing Tai Chi, dance and music performances in the amphitheatre, once with a real Venetian gondola gliding by on the night of a full moon. And, of course, the re-opening of Laguna Gloria after its restoration in 2003 was a magical event. MH: What do you wish everyone knew about Laguna Gloria? - LG as a gateway to the Hill Country is an apt metaphor that acknowledges its interlocking of eastern and western plants and animals, as well as typifying the north-south migratory bird flyway along Texas’ rivers. - Over 150 bird species have been sighted, especially migratory waterfowl. Welcome to my 7-part series, about Randy Avers. Randy is one half of the fabulous duo, Les Frères Méduses, who are writing and performing the original, live film score for us that will be performed on June 22nd to open our summer series. Info here. When the Alamo’s Tim League asked me about creating an original film score for one of his favorite silent films (“The Unknown,” 1927, Dir. Tod Browning), I knew that no other duo on the planet was more perfect for the task than Randy (who is based now in Norway) and his amazing French duo partner Benoît Albert. Randy and I went to college together and I wanted to share a few stories. Randy and I met in fall 1993. I was 17. He had transferred to Oberlin Conservatory as a sophomore and completely rocked my world. Sometimes in concert, when I’m talking about one of my favorite pieces – a piece he introduced me to – I am fond of saying that up until the day we met, I was the best guitarist I had ever met! It’s not true, of course, but in my own little world – apart from my teachers – I had not ever seen truly transcendent playing by a young person. And that meant I was a very big fish in the little pond of my imagination. Randy changed all that – and in the best way. A year or two before, Randy – at 17 – had become the youngest-ever finalist in the world’s most prestigious international guitar competition – The Guitar Foundation of America. He took second that year. And when he arrived at Oberlin, it was like a whole new world of music and excellence came rushing into my world along with him. That “piece” I mentioned above is the Elegy by Johann Kaspar Mertz. One of my all-time favorites. The first time I actually cried in a concert hall listening to music was the first time I heard Randy play it. I like to joke that I’m not sure if I was crying from how beautiful his playing was, or how freaked out Matt the 17-year-old guitarist was at seeing such fabulousness on the guitar! Randy became one of my greatest friends and inspirations. He was a groomsman at my wedding, and I at his. He’s been, many times, to Austin over the years to the great delight of all who have heard him. And we remain incredibly close in spite of the Atlantic Ocean and vast expanses of land between us. One World Theatre is one of Austin’s great treasures. Every time I go, I feel like I’m in touch with something deeply artistic and authentic. It has been such a pleasure to have our Guitars Under the Stars gala evenings there the last few years – and our guests have universally loved the setting. The first time I visited, I wondered how a place like One World Theatre could come into existence! I’ve had the pleasure recently of working with One World Theatre’s Founder and Executive Director Hartt Stearns in the run up to their May 2nd presentation of flamenco icon Paco de Lucia. I thought I’d ask him a bit about the magic behind the theatre and all that happens there. I also wanted to mention that One World is offering fans of ACGS 10% off tickets to see Paco de Lucia. Paco is inarguably the most influential flamenco guitarist of our time! Even though it’s 5 short days after the amazing Yamandú Costa, you must go see this concert!!! You can Purchase tickets here for Paco de Lucia and enter code “ACGS” to obtain your discount (good for all but premium-level seating). Or call One World at (512) 330-9500 and mention ACGS! Matthew Hinsley: Hartt, One World Theatre seems like is a work of art in and of itself, how did the concept come about? Hartt Stearns: We’re very proud of the fact that we have a green-built work of art in which to present world-class performers. We were doing green, even before it was all the rage. Our buildings on the property (built in 1998/99) are made from a combination of rastra (which is 85% recycled Styrofoam) and straw bale construction. Many straw bale constructed buildings are kind of funky looking, and it is unusual for them to have such an artistic flare. The concept was to have artists (my wife, Nada and I are both musicians as well as are many of the staff), present artists, in a piece of art. The beauty is magnified inside by the amazing acoustics and sound, and outside with the Austin Hill Country as the backdrop to this wonderful architecture. MH: Paco de Lucia is a legend - one of many you've presented - how do you get the amazing artists you bring here, what's your selection process? HS: I do the booking myself, so it’s a combination of artists that I know and have admired throughout the years, along with ones that are suggested from agents that recommend talent. MH: We love having our gala at One World - you also do all kinds of things for the community, I'd love to hear about your community programming. HS: We sponsor a number of artists from different cultures to go into the schools to perform assemblies and give workshops. We also present theatrical productions (Story Books Brought to Life) at One World Theatre that are for kids and families, where half of the tickets are given away for free to underserved families and organizations. And we have a summer camp where we give free admission to children of deployed soldiers. The final performance of the summer camp is seen by the deployed parents/soldiers from Iraq and Afghanistan through videoconferencing. We have screens at the theatre that allows our audience to see the soldiers watching their children perform. It’s a very moving experience. MH: Wow Hartt, that’s amazing. What's next for One World Theatre? HS: We have plans to expand the theatre but are waiting to get over some hurdles with the City of Austin. In the meantime, we’ve been doing shows at the Riverbend Centre, where we’re presenting Paco De Lucia, as well as Merle Haggard, Ravi Shankar and The Chieftains this season. MH: All those shows sound amazing and we are, of course, especially excited about Paco de Lucia! Is there anything else you'd like to add? HS: We’d love to do more in collaboration with the Austin Classical Guitar Society. We have presented a number of brilliant guitar players over the years, and although they have varied in genre, I do think any guitar player or aficionado would appreciate the talents of Larry Carlton, Tuck Andress (of Tuck & Patti), Bela Fleck (banjo), California Guitar Trio and Montreal Guitar Trio - who we’re presenting this season - and other amazing musicians like Pat Metheny, Al Di Meola, John McLaughlin, Mike Stern, The Assad Brothers as well as Badi Assad who we’ve presented over the years. MH: We’d love that too, Hartt, and we look forward to making it happen. Those are all amazing artists indeed! Thank you for all you do for our community! Isaac Bustos - Saturday Night! I'm super excited to be presenting Isaac Bustos this Saturday evening at 8PM. Isaac is a fantastic performer. I've heard him many times, and he just keeps getting better and better. It's a landmark moment in some ways too, because in my 15 years with ACGS, this is the first time we've ever presented a "local" player on our flagship international concert series. Isaac is, of course, originally from Nicaragua, but he did is graduate work right here in Austin. Amazing players, truly world class players, have come through the amazing UT guitar studio, but even so, Bustos is the first we've ever presented on the ICS. I hope that gives you a sense of just how much I admire this wonderful talent. I'm simply thrilled for Saturday's show. We'll hear beauty, color, nuance, speed, clarity, the whole nine yards. If you'd like to join us, you can buy tickets online now, or give us a call at 512-300-ACGS. The concert begins at 8PM Saturday at Northwest Hills United Methodist Church (7050 Village Center Drive). Arrive early for a pre-concert performance presented by students in the Akins High School guitar program. Isaac will also teach a master class to pre-selected students, also at Northwest Hills, Friday from 4-7 (free and open to the public). The idea of Austin Guitar Salon first occurred to me in the car as I was driving south on Speedway from 45th Street in Hyde Park. It was so simple! I was driving past a large, stately home with a plaque on the front designating it’s historical significance, and the whole vision just popped into my head: “wouldn’t it be great to present classical guitar concerts in historic homes with wine and cheese receptions?”! Doing something in historic homes in Austin means The Heritage Society of Austin, and I have two particularly good friends, Lazan Pargaman and Lin Team who popped into my head as the perfect people to call to flesh out the idea. By the time we had sat down for lunch, I’d already met with John and Kendall Antonelli from Antonelli’s Cheese Shop, and so Austin Guitar Salon was beginning to take shape. Lazan and Lin went beyond helping me flesh out the idea, and they went beyond connecting me with the Heritage Society of Austin, they offered – through The Kinney Company – to sponsor our entire first series (spring 2011). And they are sponsoring our fall 2011 series as well. I am incredibly grateful to Lazan and Lin and The Kinney Company for helping turn this daydream into a reality, and I thought it might be fun to learn a bit more about them. Matthew Hinsley: Tell me about yourselves and the Kinney Company. How long have you been in Austin? Lazan Pargaman & Lin Team: Founded in 1995, The Kinney Company is a small real estate agency with a special focus on homes in Central Austin. We pride ourselves in providing our clients with exceptional client service and hands-on attention to detail. Currently, there are three of us, all with long histories in Austin and with combined experience in real estate totaling over 38 years. MH: You are sponsoring a collaboration between ACGS and The Heritage Society of Austin. I believe you have long connections with both organizations, and I’d love to hear about them. LP&LT: As realtors with a special interest in old homes, all of us at The Kinney Company have long supported the work of the Heritage Society of Austin. Company founder Teddy Kinney and Lin Team have served several terms on the board of the Heritage Society through the years. Lin is currently an active board member and has recently co-chaired its Preservation Committee. When Lazan's daughters took up classical guitar six years ago, she got involved with the Classical Guitar Society and became not only a new audience member at the wonderful concerts but also a supporter of the Educational Outreach Program. Coincidentally, a few years back, Lin helped a nice young couple buy a home here in Austin. The man was a doctoral student in guitar at UT. Through him, Lin became involved in the Austin Classical Guitar Society and has had the pleasure of watching him build it into the terrific organization that it is today. Lin thanks you, Matt! MH: I remember that well, Lin! Glenda and I are incredibly thankful for the home you found us – and we’re still happily living in it! Why do you feel it’s important to give back to the community? LT&LP: At The Kinney Company, we believe that supporting programs for those in need is a responsibility we all share and we feel blessed to be able to do so. But people need food for the spirit as well, and that’s a role that music, the arts and architecture can help play in our lives. We find a lot of satisfaction in supporting programs to which we have a special connection because of our personal interests and professional expertise. Although none of us plays the guitar, we all enjoy the music. And, we all have a deep appreciation for old homes. This salon series has been great fun for us because it’s the marriage of these two interests! MH: Are there other organizations or causes you like to support? LT&LP: Lin’s background is in advocacy for progressive social causes. For many years she served as Director of Texas impact, a broadly ecumenical, faith-based advocacy organization working to change social policy at the state level. She still serves on the board of Texas Impact. Lin has also been active in neighborhood planning and organizations, where she finds all politics to be truly local. “Democracy at its most immediate -- and tedious -- is played out in our neighborhoods, and I feel a deep obligation to work with these groups to bring people together to share visions and solve problems,” (Lin said). Lazan currently serves on the board of The Austin Project, a non-profit organization designed to improve the lives of children, youth and families, by strengthening families and promoting early literacy. She is also involved in the Fine Arts Academy at McCallum High School, promoting the arts and artists in fundamental ways in our public education system. MH: Well, we’re so looking forward to this Saturday and the concert at Jane Sibley’s incredible home. Thank you so much for helping us to make it happen, and I look forward to seeing you both there! Before we go, is there anything else you’d like to share? Historic preservation plays a similar role by connecting people with art, architecture, social welfare, cultural history and environmental sustainability. We enthusiastically support both the Heritage Society and the Classical Guitar Society as a way to participate in that interconnected vision. Classical Guitar Alive! is a global classical guitar radio phenomenon produced right here in Austin by Tony Morris. 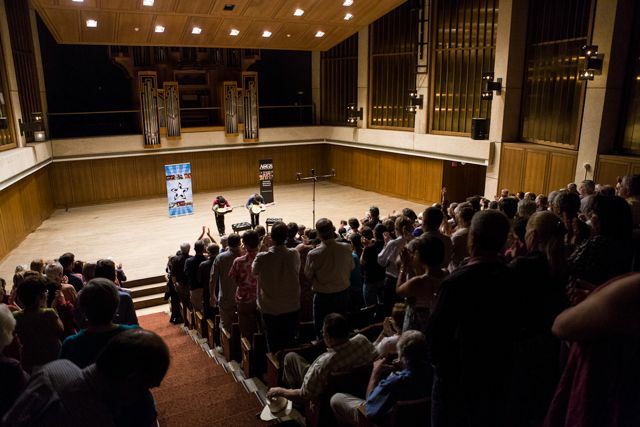 The show airs in Austin on Fridays at 9PM and again on Sundays at 11am on KMFA, 89.5FM, and each week brings insight, interviews and great music with guests that range from composers and guitar intellectuals to up and coming virtuosi to the classical guitar world’s brightest stars. Classical Guitar Alive! has a wonderful fundraiser coming up on Saturday, October 29th, one I attend almost every year, and I thought I’d try to snag Tony for a quick conversation about himself, his wife – and fabulous flute player – Renata Green, his show, the fundraiser, and more. Matthew Hinsley: Tell me how you first got interested in producing Classical Guitar Alive? Tony Morris: I started doing the Classical Guitar Alive radio program in 1993, shortly after graduation from UT with my Master’s in guitar with Adam Holzman. Like a lot of students nearing graduation, I worried about career options. I took that to mean that I was going to get the job, so I prepared for the move to Houston, and began brainstorming about how I could establish myself there. I came up with an idea to do a guitar radio program on one of the local public radio stations there. I was devastated when I learned that I didn’t get the job. They hired a local guitarist instead. Anyway, I picked myself up and realized that the guitar radio program was still a good idea, and that maybe I could do it here in Austin - even though I had absolutely no Radio-TV-Film training… and in those days was painfully shy and hated public speaking. What was I thinking?! Nevertheless, I started pestering both KMFA and KUT, and KMFA relented first. Scott Dawes, the program director then, agreed to do a guitar show on a trial basis, and the first CGA show aired on KMFA in October of 1993. The opening and closing theme music back then was a piece that I wrote and recorded. I chose the name “Classical Guitar Alive” because I had read an article in Guitar Player Magazine titled “Is Classical Guitar Dead?” The radio program was and is my rebuttal. In the beginning, I would go to KMFA, record my commentary on their reel-to-reel tape machine, and then hand them a playlist and stack of CDs. The on-air announcer would play the tape, pause it, and then play a track from the CD according to the playlist. A few months later, I was offered a part-time weekend announcer position at KMFA, and I started doing CGA live. It was terrifying at first, but exciting, too. MH: I didn’t arrive in town until 1996 – but already Austin was buzzing about the show. I remember one particularly colorful evening after we had presented Bill Kanengiser in concert, and Bill and I came by the KMFA studio so the two of you could do an interview. It was after midnight! The show has certainly grown, Tony, tell me about the growth, what has been most exciting? TM: The show is now on over 250 radio stations across the US and internationally, which sounds like a lot, but there is still a lot of room to grow. The most exciting thing recently has been that CGA is now finally broadcast in New York City, thanks to the expansion of the WWFM network in New Jersey. I have been trying to get CGA on in NYC for years. We also recently added stations in Philadelphia and Atlanta, both major markets. MH: Let’s talk about this event coming up for you later this month. I’ve been many times and love it… what is it, and can folks still get tickets? or send an email to ClassicalGuitarAlive@gmail.com. You can also purchase tickets online here. MH: I'd love to hear a bit about Tony Morris the guitarist, and CGA's performance outreach. TM: Thanks! Flutist Renata Green, my wife, directs CGA’s Community Outreach program. Most arts nonprofits do community outreach, like ACGS’s wonderful educational outreach, but CGA’s outreach program is unique in that we are the only one that sends our musicians to perform in hospitals, children’s shelters, hospices and more. I’ll never forget, over a year ago, Renata, oboist Jennifer Bernard, and I performed in the lobby of the Dell Children’s Hospital. There was a little boy about 8 years old with severe burns walking with his grandmother. Despite his injuries, he started marching around in time to the music and got very excited, asked us about the instruments. His grandmother was very happy to see him so enthused, and I was so proud of Renata and Jennifer for their professionalism and for how engaging they were with him. My first performance in Austin was Christmas Eve, 1990. I had just moved here, didn’t know anyone, and didn’t have family or friends here yet, so I was feeling a little lonesome and sorry for myself. I made myself snap out of it and called a local hospice and asked if I could play (pro bono) for their patients. I played at Hospice Austin’s Christopher House for an audience of two people: a bed-ridden patient in the final stages of full-blown AIDS and his nurse. The patient said, “Oh, a classical guitarist. Know any Albeniz?” I started doing volunteer outreach when I was an undergrad student for the performance experience, and just kept doing it. MH: You and Renata are animal lovers. Tell me about your pets? TM: We have two dogs, Lucy, Jiggly-Puff, and a 3-legged cat with the unfortunate name of Gimpy (we didn’t name her that). We don’t have kids yet, but if you total our pets’ weight, they’re roughly equivalent to one child, albeit a very smelly and poorly-mannered one! MH: Thanks so much for taking the time to talk with me today, Tony. It’s tremendous to get an update on your amazing work, and to learn a bit more about your journey here. Is there anything else you'd like to share? TM: Come on out to CGA’s event in Wimberley on Oct. 29th! And, there are two big projects in the works, a PBS TV program called American Classical that CGA is developing in conjunction with KLRN, which did the pilot for The Antiques Roadshow. The format is part home tour, part house concert with classical guests and stars from other kinds of music. I told my co-producer that that I was concerned that I had a face made for radio, but he reassured me by saying, “Tony, no one is too ugly for PBS.” Whew! What a relief! He did tell me to drop some weight for the cameras, which I’ve done. I can’t say more about the second project, other than it is very exciting. I recently had to choose between expanding CGA’s work, doing these two new big projects or continuing my adjunct guitar professor job at Texas Lutheran University in Seguin, TX. I did the unthinkable in the guitar world, which is to voluntarily leave a college teaching job (and on very good terms, I should mention!). CGA’s mission is to promote the love of classical music with the guitar to the widest possible audience in innovative ways which have the deepest impact. The second project is not a CGA project, but it sure does fit its mission. Matt Talks with Peter Bay about Austin Pictures! I had a wonderful time sitting down to talk about Austin Pictures with Peter Bay recently. We were in the Long Center's Kodosky Lounge looking north at downtown Austin. Beautiful!